Under the guidance of moderator Mrs. Heather Land, members of our Future Business Leaders of America (FBLA) attended the Southwestern Area FBLA Conference held January 19 as Kaskaskia College. The following students earned awards for the events in which they competed either prior to or at the conference: Ben Kassen (1st in Cyber Security); Anna Klostermann (1st in Hospitality); Alexis Patton (1st in Business Communications); Matthew Sinnock (1st in Journalism); Madison Stone (1st in Political Science); Ashlyn Vonder Haar (1st in Introduction to Business Procedures); Nick Hummert (2nd in Securities & Investments); Meredith Innes (2nd in Business Communications); Jun Moon (2nd in Computer Problem Solving); Faith Rackers (2nd in Insurance & Risk Management); Max Harad, Will Schleper, and Nick Wolden (2nd in Management Decision Making); Katie Toennies and Emily Wiegmann (2nd in Marketing); Mailee Toennies (2nd in Introduction to Business); Jacey Wieter (2nd in Agribusiness); Ellen Antonacci (3rd in Introduction to Business Communication); and Bennet Krebs (3rd in Securities & Investments). Members of our FBLA who attended the Southwestern Area FBLA Conference that was held January 19 at Kaskaskia College are (front, from left) Mailee Toennies, Anna Klostermann, Emily Wiegmann, Amy Boeckman, Alexis Patton, Caitlin Trame, Grace Rapp, Claire Wilke, Katie Toennies; (back, from left) Max Harad, Nick Wolden, Ashlyn Vonder Haar, Matthew Sinnock, Bennet Krebs, Ben Wilke, Nick Hummert, Wil Schleper, and Jun Moon. 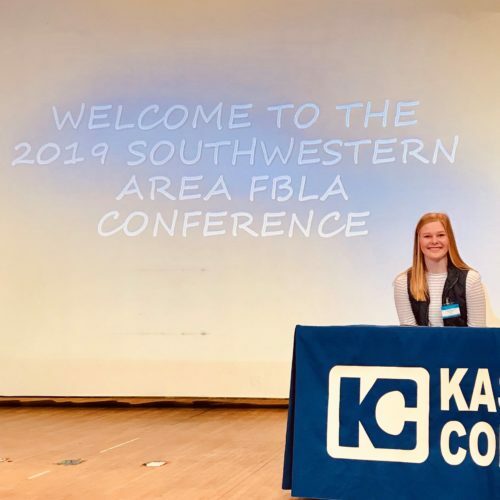 Senior Emily Wiegmann, 2018-2019 Southwestern Area FBLA Vice President, is pictured presiding at the Southwestern Area FBLA Conference that was held January 19 at Kaskaskia College.